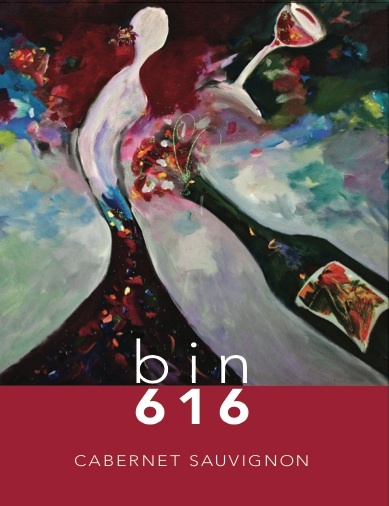 Stephanie is excited to announce the use of her artwork on the new bin616 line of wines, available exclusively at the Amway Hotel Collection, including JW Marriott, Amway Grand Plaza and Courtyard by Marriott hotels! 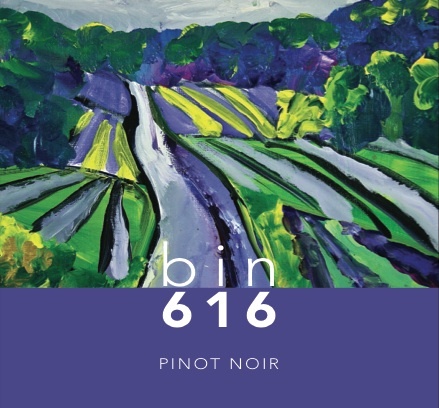 Her colorful pieces — two figurative, in honor of us, the wine drinkers; two centered on the land, a nod to the farmers, the winemakers and the fruit itself — will appear on bottles of bin616 Sauvignon Blanc, Chardonnay, Cabernet Sauvignon and Pinot Noir. “A skip of my heart — my soul stirs and a smile spreads through me as I take in the vista before me. The lush green goes on for miles, over gently rolling hills striped with rows of vines, vines laden with grapes that eventually will become wine. Ahhh… wine country. In this case, we’re talking about Pinot Noir, the wine of surprises. Yes, it’s light, and its colors more ripe ruby than its deeper burgundy and amethyst neighbors, but it surprises with its ability to be complex. At times the layers tell more of a story than you might initially expect. The story it tells — that all wine tells — is about the land. It has been said that wine can not tell a lie: Every rainfall, every sunny day, every visit from the winemaker, everything is recorded right there in the bottle. It is this bottling of truth, of history, that captivates me and serves as inspiration for this painting. The land where wine comes from is as complex and beautiful as the wine that comes from it. bin616 artwork will appear at the JW Marriott during ArtPrize, Sept. 18-Oct. 6. For more information, click here. The Goddess of Cabernet: It’s about celebration, femininity and moments to remember. “It all started in Florence, several years back. I was in the Uffizi, standing in front of Bacchus, the Roman god of wine, as painted by the great master, Caravaggio. Mesmerized as I often become by the great works of art from our past, I began to wonder: What would a goddess of wine look like, and how would I interpret her? Out of my curiosity, a series was born, depicting the female figure in celebration with wine. I culled many of my references from Greek sculpture and mythology, but even more stemmed from the amazing women in my life. Confident and strong, inspiring and fun-loving, ready to celebrate life’s victories and mourn its sorrows by your side. It is also inspired by you, the wine drinkers, the ones who take mythology and history and turn it into the here and now today.